Because, Baby, it's COLD Outside! | What Smells So Good? Cold weather is always a mixed group of feelings for me. On one hand, cold means snow, slush, leaky winter boots and head colds circling the neighbouhood faster than my dog can chase his tail. However, the flipside of the situation, cold weather also means the promise of Christmastime, Hanukkah, warm fires and friends coming home from school. Comfort abounds in the Fall and Winter months, bringing delicious smells and tastes to our house. A heads up for everyone reading - December will be bringing baskets of cookies to the blog!! My mom's spectacular shortbread cookies, of course, are on the menu, as are chocolate chippers, and our oven will crank out a hand-kneaded and shaped loaf or two (or four). Thank God we aren't doing the turkey this year, but we are hosting the brunch in the morning which means a whirlwind of activity, some special goodies, and wrapping paper in coffee cups (with luck, an avoided occurrence). I was fortunate enough to recieve some special goodies of my own in the mail yesterday, too! Marie from A Year From Oak Cottage had sent me a beautiful packet of soaps as my prize for winning her "Show Us Your Sarnie" event way back in October. They look beautiful, and smell even better! 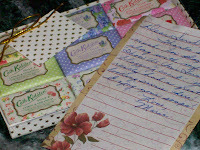 Thank you Marie, both for the soaps and for such a wonderful event! Until December arrives, however, there is no lack of comfort food to fill the gap! Soup and "fake" bread pudding are on the hob today, the chowder being a vegan, wheat-free and low-fat concoction, the "Pharoh's Cake" taking the role of the sweet, easy, guilty comfort food (there won't be too much guilt, I promise!). Cut the tops of the broccoli into small flowerets; julienne the stems. Heat a large stockpot over medium-high heat. Spray with cooking spray and add onion. Sauté 6 to 7 minutes. Add the soy sauce and the tomato. Cook, stirring often, until the tomato's juice has evaporated, about 5 minutes. Add the stock to the soup pot. Add the pumpkin or squash puree, the maple syrup, salt, and black pepper. Heat, stirring often. Separately, steam the broccoli 4 minutes. Stir broccoli into the soup. Add the tofu puree and the soymilk. Let the soup cook over low heat, stirring occasionally, 10 minutes. Do not let the soup boil. Serve hot. The best part about this dish is that there are only 3 ingredients! 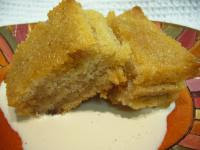 It is sweet, tastes a little like a simple bread pudding, and is pretty rich so a small slice is plenty. Remove the crust from the bread. Soak the slices in honey for at least a half hour. Lightly grease a small deep baking dish. Using a spatula, pile the slices of bread evenly, one on top of another, in the baking dish. Top with evaporated milk and allow it to soak in before serving. 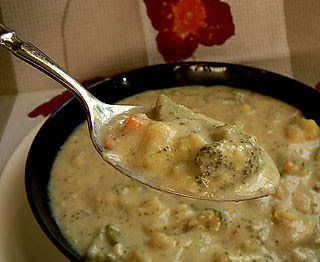 Wow, that chowder looks gorgeous! Yum! Mmmm. It alllooks very comforting Sara!!! !